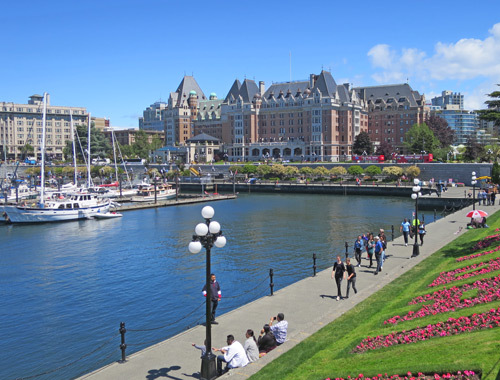 Famous Victoria landmarks are the BC Legislature, Empress Hotel, Inner Harbor, Royal BC Museum and Beacon Hill Park. Other top tourist attractions include Butchard Gardens, Totem Park, the Maritime Museum and beautiful Dallas Road oceanfront. Popular activities include cycling, golfing, hiking, sailing, kayaking, sport fishing, whale watching and shopping. Excellent accommodation can be found in downtown Victoria, Esquimalt, on Gorge Road and in nearby communities. Most visitors arrive in Victoria by ferry from Seattle, Olympia or the Lower Mainland. Others arrive at Victoria International Airport.